I use little snippets of testmonials throughout this website (the full gallery of images is below), and on this page you can find the full transcript of each one provided to me, so that you can see I’m not making anything up 😉 Feel free to contact anyone on this page to ask about our work together! 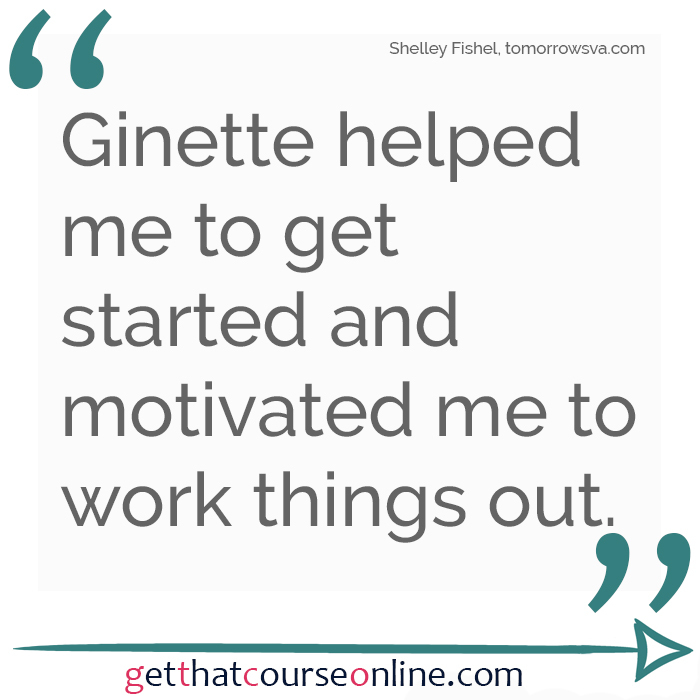 I first worked with Ginette to help me overcome the overwhelm I was feeling as I planned my online business. 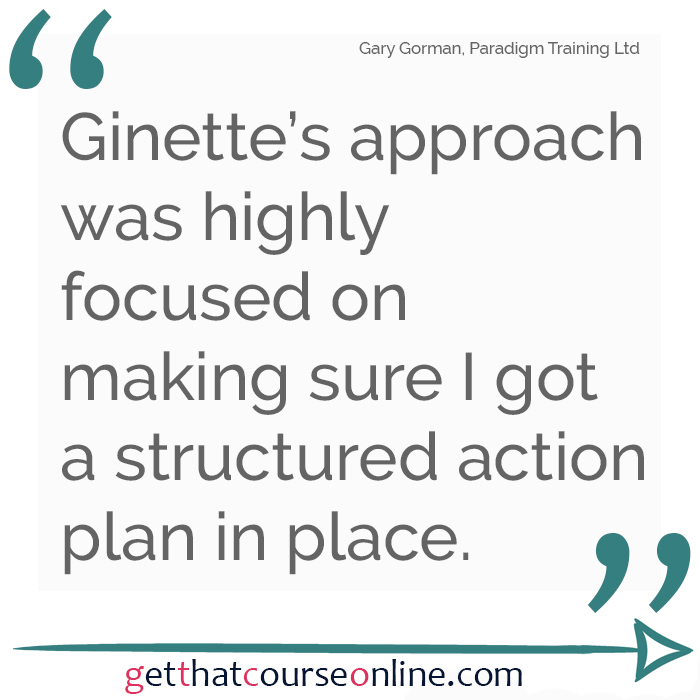 Ginette helped me to cut through the long list and prioritise what was needed. She helped me to get started and motivated me to work things out. 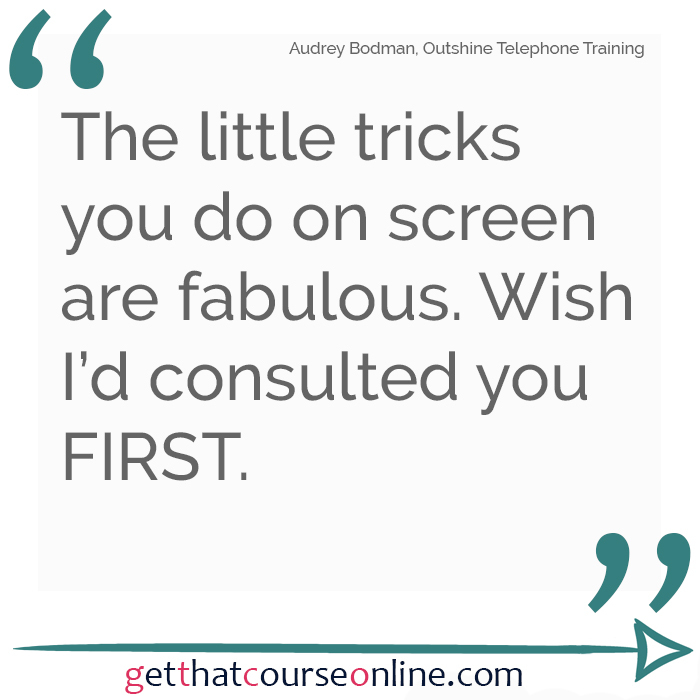 Following on from that I started to create my online courses and have done quite well. Since then I have attended a challenge called Finished in 5 – a module every day for 5 days with homework along the way. 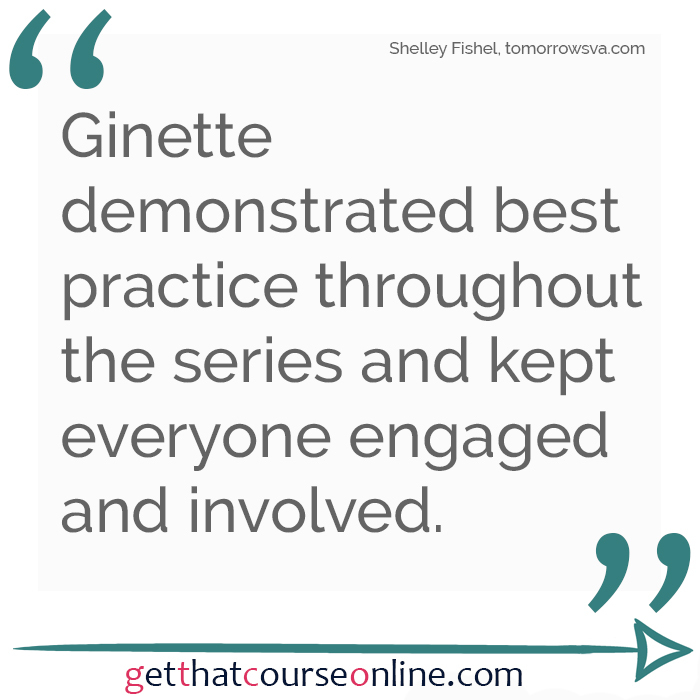 Ginette demonstrated best practice throughout the series and kept everyone engaged and involved. I have learned so much more. I am now going to revisit the online academy I am building and will make huge improvements so that it is the best out there. 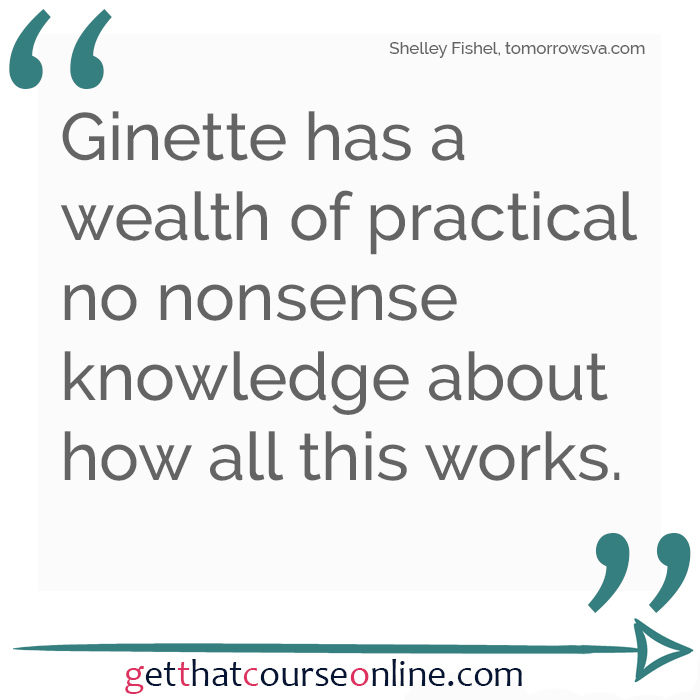 I will continue to work with Ginette who has a wealth of practical no nonsense knowledge about how this all works. 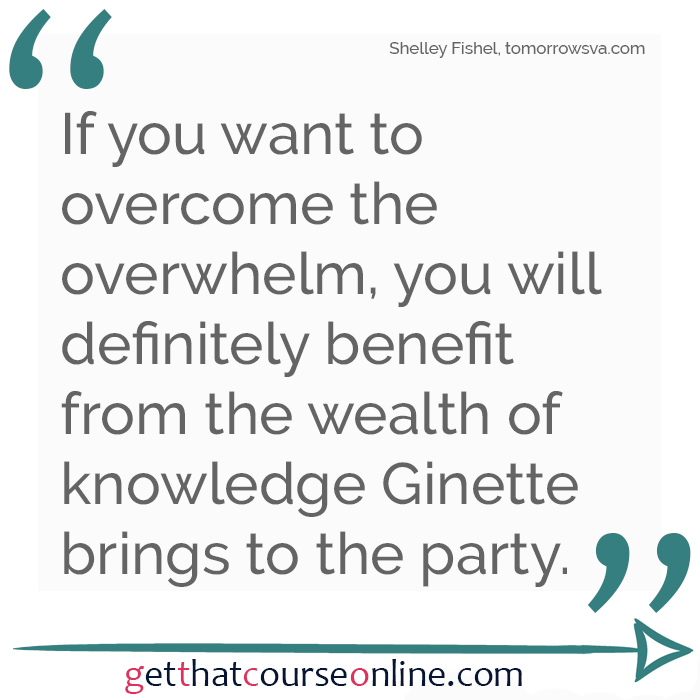 If you are planning to add online to your training business and you want to overcome the overwhelm, you will definitely benefit from the wealth of knowledge that Ginette brings to the party. 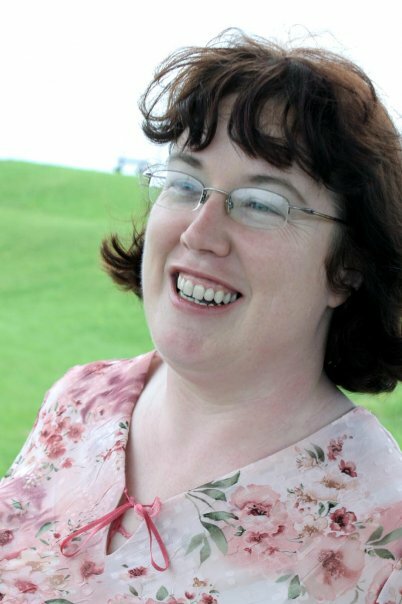 Anne Walsh is a freelance trainer with over 20 years experience. 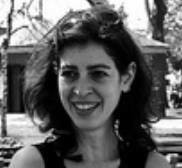 She is the author of “Your Excel Survival Guide: Your guide to surviving and thriving in an Excel world. 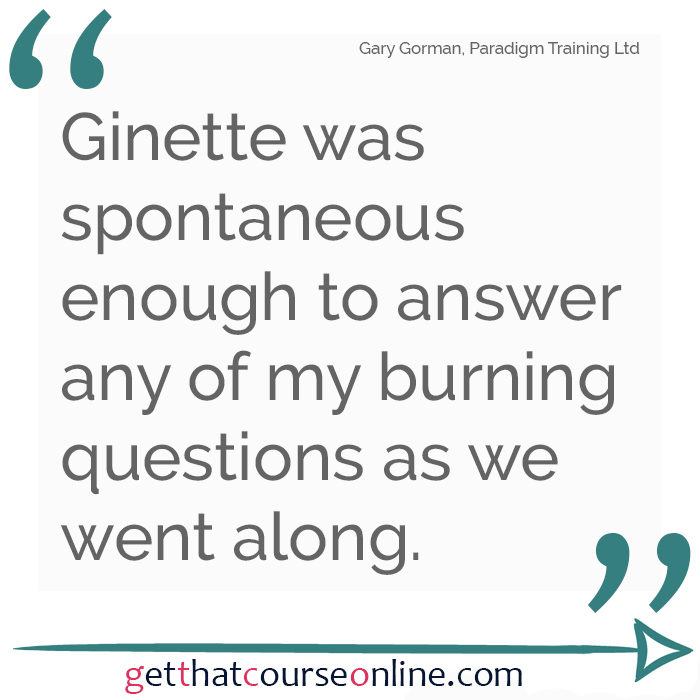 My experience with online training prior to doing this course was doing videos for my course and having quite a number of commenced but not completed online training course ideas – sort of like cakes with bites taken out of them 😊 . It’s something I kept meaning to do. The daily course check-in provided an excellent structure to make me look at part of the whole process that I hadn’t thought of. It’s inspired me to actually plan out, work through what I need and COMPLETE this course. The course is “Track your training in Excel – so you always know who has done what, even if you can’t remember who they are”. It’s for people who don’t have the resources for a bespoke training system but who nevertheless need to record and track the training done by their staff. 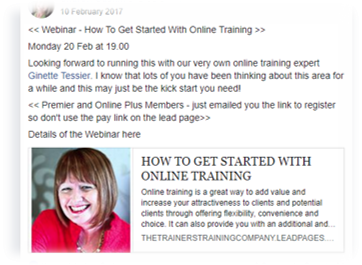 Experience: Created online training for 10 years as an employee of a bank and created an open live webinar programme last year. 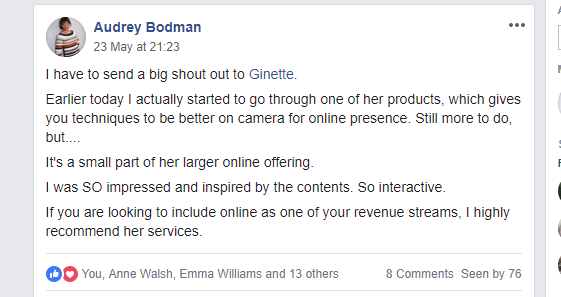 My Course on the challenge was ‘Know Your Value (and stick to it)’, helping self-employed people putting a value on their products and services to know their value and stick to it in the face of challenges. 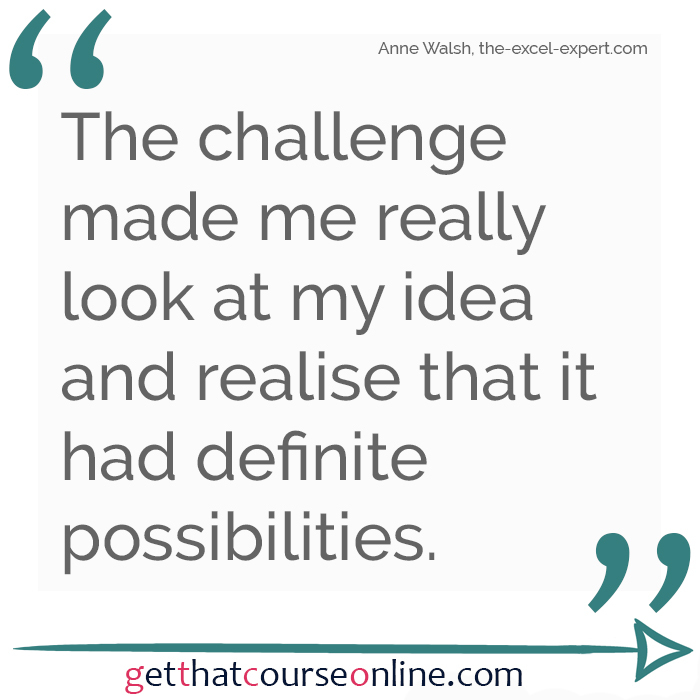 “I achieved more in the five-day challenge than I have in a month’s worth of trying to get a course online. 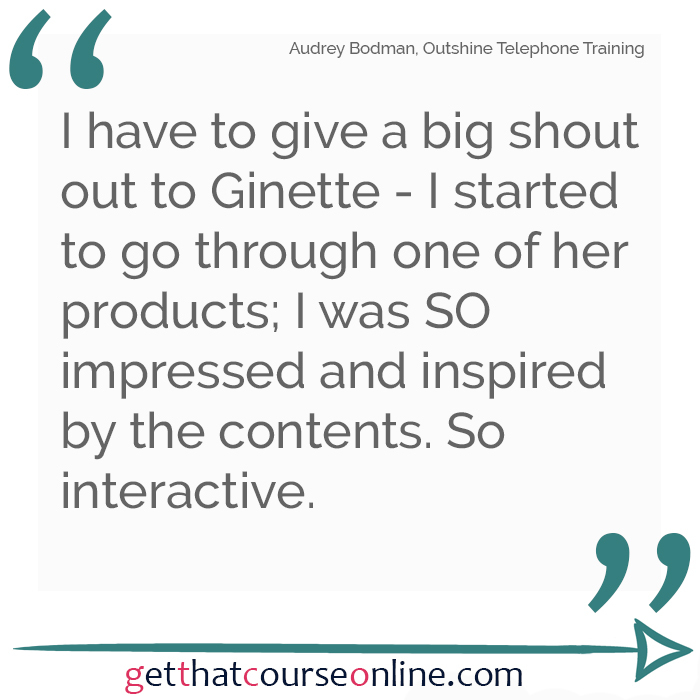 Ginette covered everything from structuring your course to marketing and selling it afterwards and shared valuable tips on every aspect. 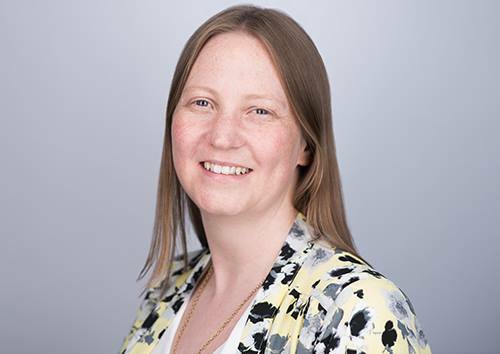 The challenge gave me confidence that I have enough, knowledge, skills and equipment to get going with online course creation and I’m looking forward to seeing what else I can create”. 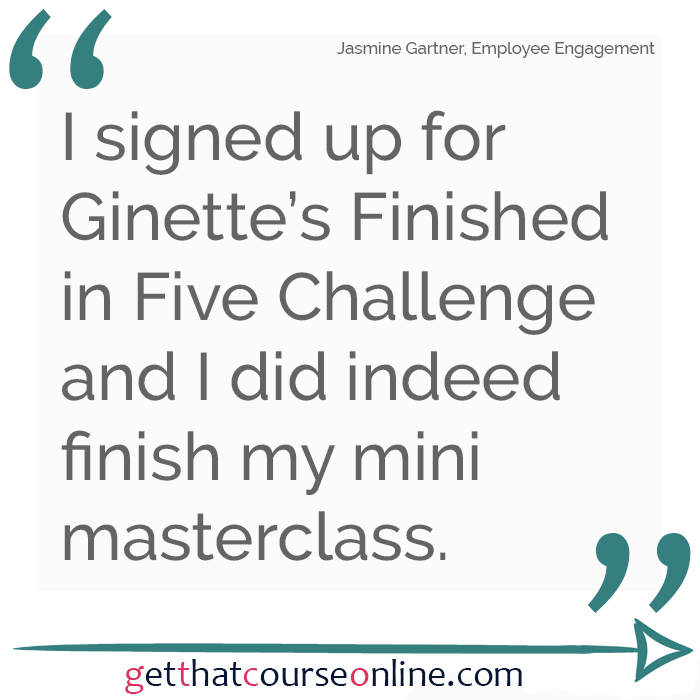 I signed up for Ginette’s Finished in Five Challenge, and I did indeed finish my mini masterclass. 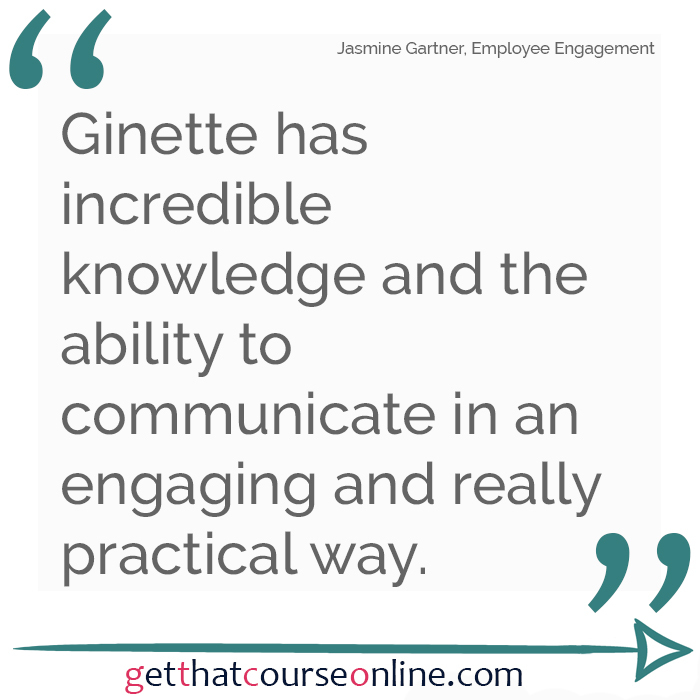 This was only possible because of Ginette’s incredible knowledge about the subject, her ability to communicate that knowledge in an engaging and really practical way, and the accountability of being part of a group. 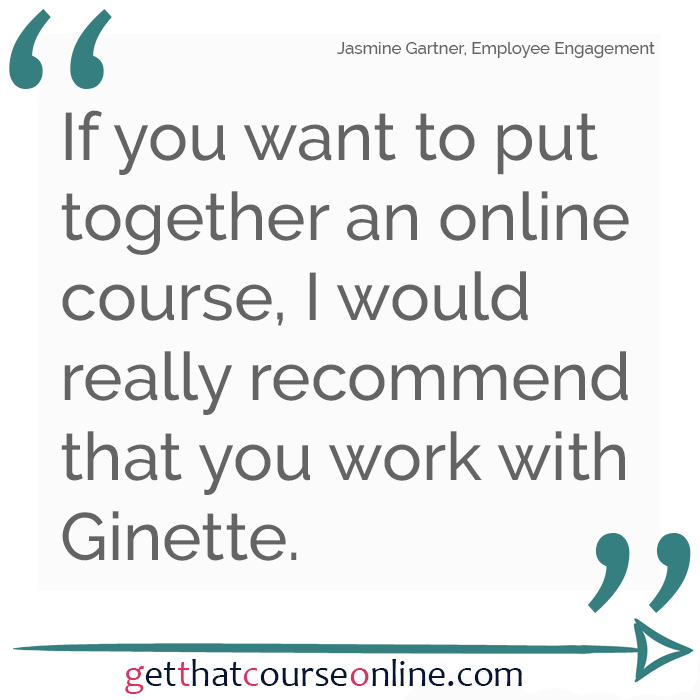 She is passionate about online training and it’s clear that she loves what she does. 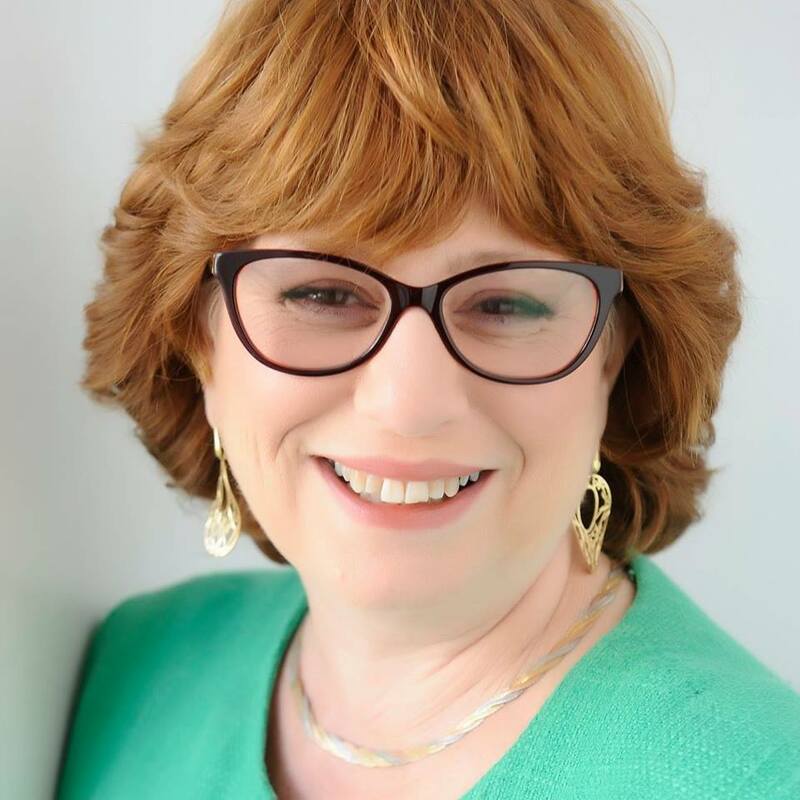 She’s warm and encouraging and has the answers you need when you get stuck. 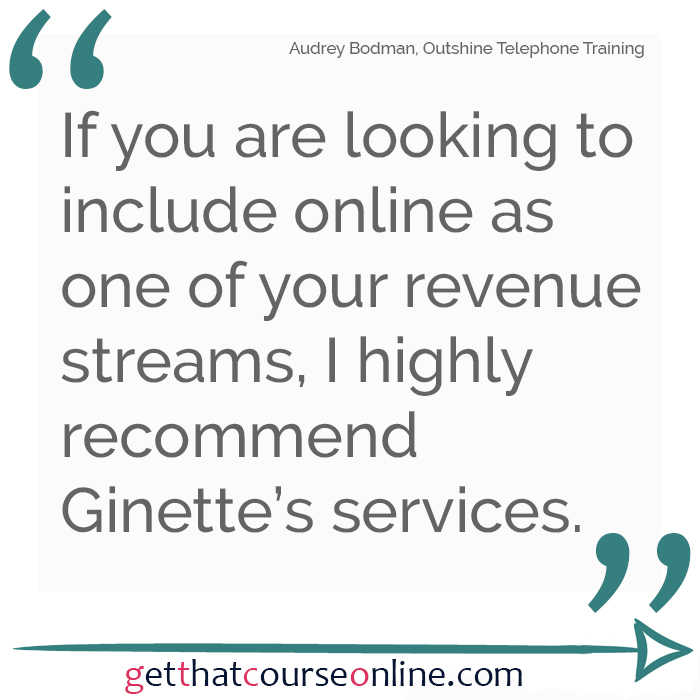 If you want to put together an online course, I would really recommend that you work with Ginette. 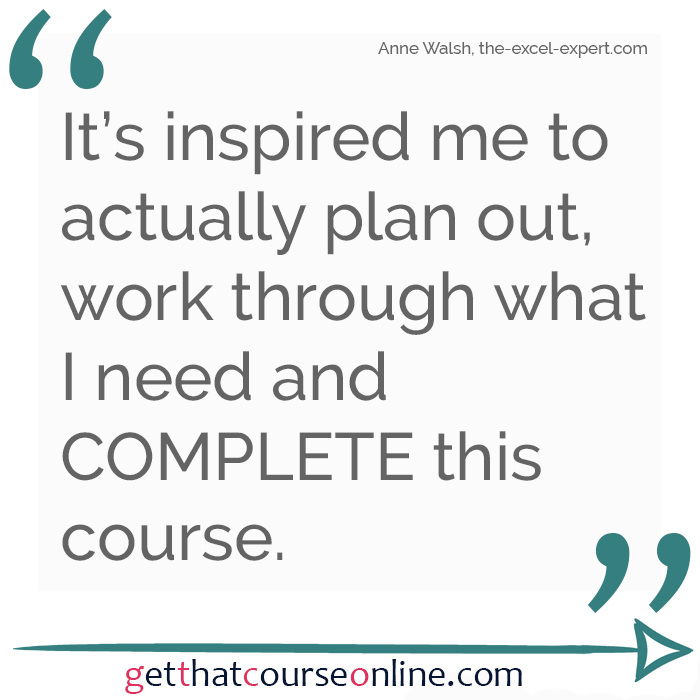 I’d always intended to launch an online course but always put it off thinking it was too daunting. 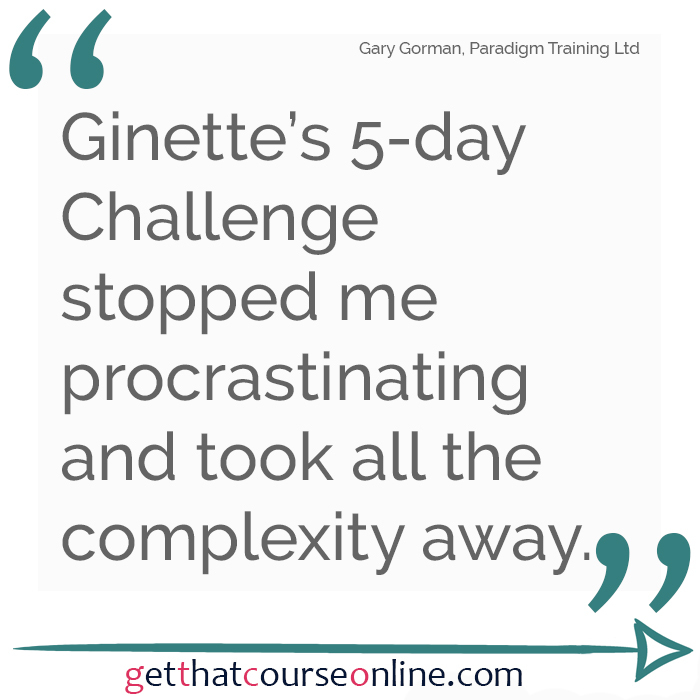 Ginette’s 5-day challenge stopped me procrastinating any longer and took all the complexity away for me. Her approach to the sessions was highly focused on making sure we I got a structured action plan in place but spontaneous enough to answer any of my burning questions as we went along. I learnt so much, I just need to implement it now and get that online course online! Experience: have run a number of webinars (but that was some years ago), have created some file-based content/resource (cheat sheets, etc) for others’ online offerings. 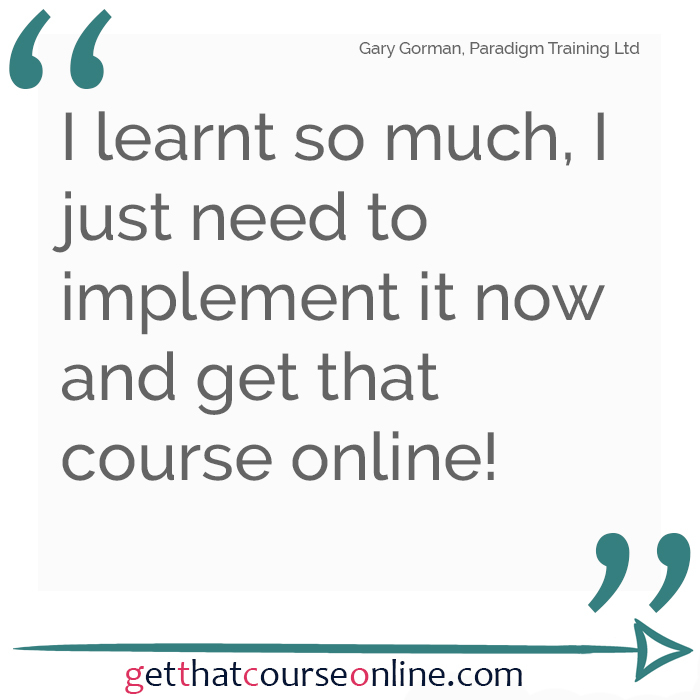 Benefits: The course really helped me to get my head around some areas I had no real idea on, like the sales funnel and how to choose a marketplace or platform for online course. 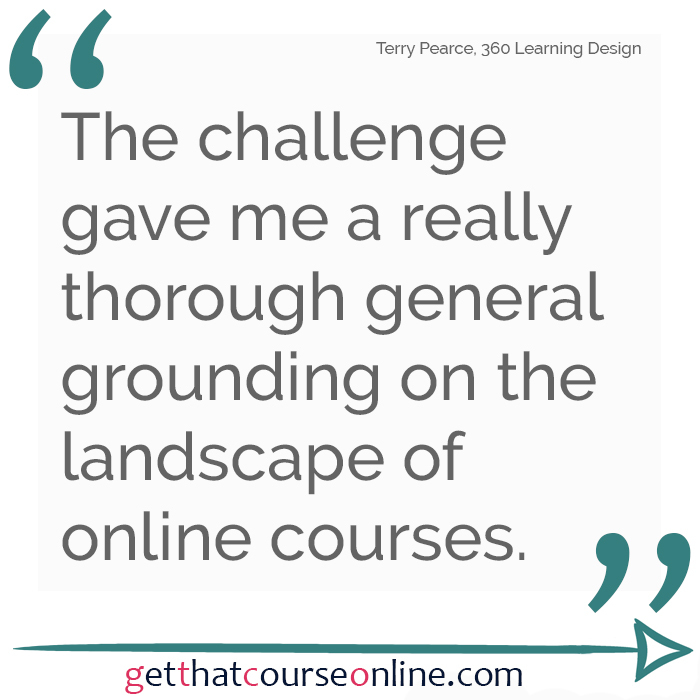 It also gave me a really thorough general grounding in the landscape of online courses. 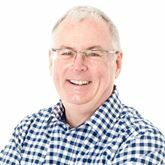 Coming away from it, I feel equipped to get stuck in to creating and selling high-quality online courses straight away. Course created: I didn’t finish in five, but that was due to my own commitments — if anyone could have helped me do so, it would have been Ginette and this course. 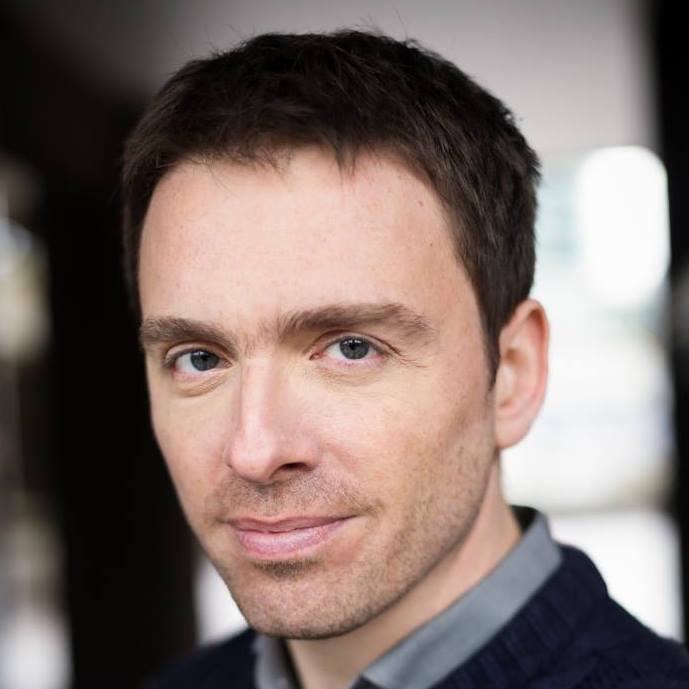 But I have come away with a full plan for creating, hosting and selling an online course in Asking Great Interview Questions, for Hiring Managers, and I’m keen to get it out there and sell it, so I’ll be doing that soon. General: I’d strongly recommend this course to anyone who’s keen to get stuck into online courses, but feels they need more tools and understanding of the context to make it work. 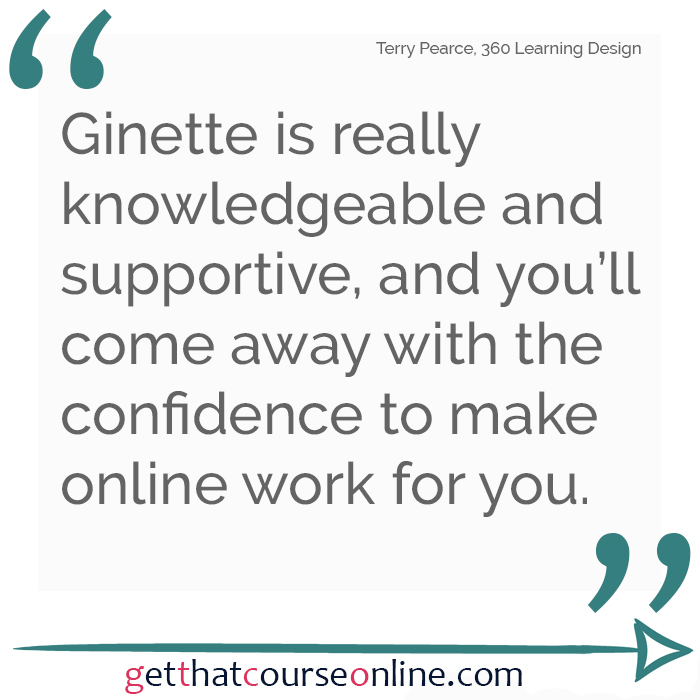 Ginette is really knowledgable and supportive, and you’ll come away with the confidence to make online work for you.